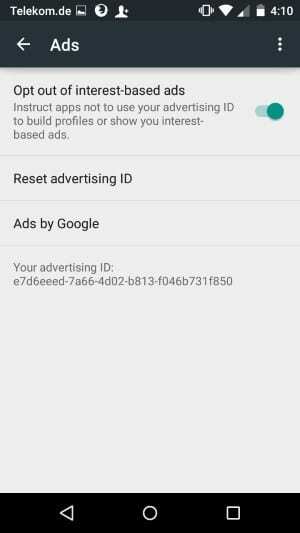 The advertising ID is a unique anonymous identifier on Android devices that is being used for advertising purposes. App developers can use the advertising ID API to access the ID on user devices, for instance to identify users and devices for targeted advertising. It is only used by applications offered on Google Play and the only allowed persistent identifier for all advertising purposes. It needs to be noted that older Android versions may not support the advertising ID and that app developers may fall back to using other methods such as using the Android ID to track users anonymously on Android. It allows developers (and Google) to create anonymous user profiles based on the ID to deliver targeted advertising to Android users. While there is no option to turn the ID off Android, options to reset are provided. Step 5 Bonus: Opt-out of interest-based ads as well on the same page. 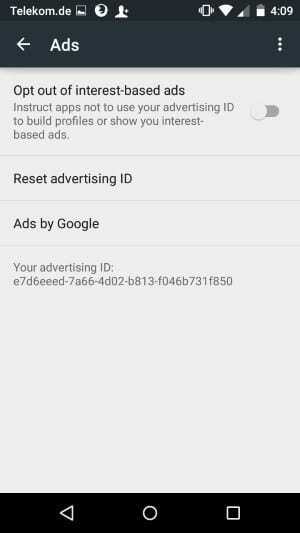 This tells apps not to use the advertising ID for tracking purposes and to only show regular advertisement but not interest-based ads on the device. 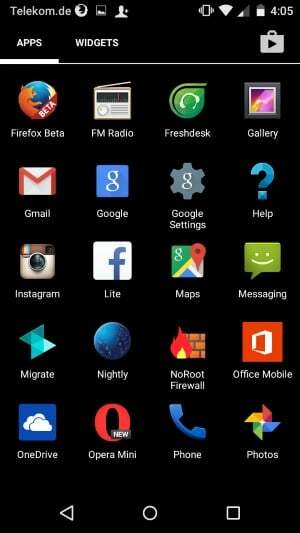 According to Google, apps must check the settings of the Android device and respect them. If interest-based ads are disabled on the device, apps must honor that. Failure to do so is a policy violation. The content policy page offers additional information on how the advertising ID may be used by companies or developers. It states that companies may not link the advertising identifier to personal identifiable information or persistent device identifiers such as the IMEI or Mac address of the device without explicit consent. Companies who use the advertising identifier need to disclose this in public privacy notifications. 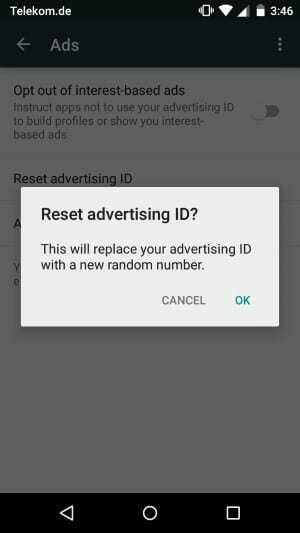 Find out how to reset the advertising ID, a unique anonymous identifier, on Android devices. That Advertising ID thing is only for KitKat and above. I though this is linked to Google Play and not a specific version of Android. Can you provide me with a link where this is made clearer? How could I tell if an app is failing to follow the policy? It would be useful to report them for policy violation. I don’t think you can unless the code is provided. I thought this explains it: It allows developers (and Google) to create anonymous user profiles based on the ID to deliver targeted advertising to Android users. Are your screen captures unique to Germany (or Europe)? I live in Texas so I would guess that North American versions would be the same as mine. Are yours different? I don’t even see how this can be done though the Google home page on a regular computer. I run a Motorola device and cannot verify this on Samsung devices. Maybe Samsung modified this part of the system and has removed it? Ahh. That is quite possible. Different manufacturers modify for their own purposes. Still … it would be nice to be able to have that ability on Samsung models. When im playing an online server based game thru the games app and for reasonr im yet to confirm I am banned..I can on my apple device reset the ID then reinstall the app and bam im a new user.. with my galaxy s2 after resetting id I reinstall the app but I am getting the old ban accnt still come up..
Is it coz its not designed for tge same purpose as apple users can use it for ? I have a Samsung Galaxy Tab 5. 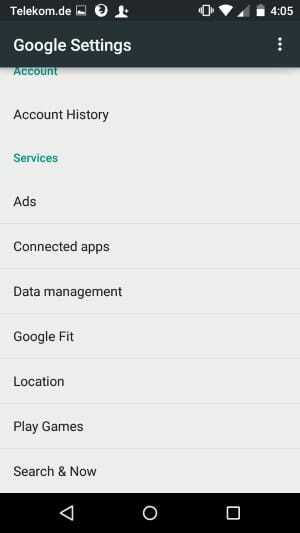 The “Google Settings” application button disappeared with a recent software upgrade to Android 6.0 (Marshmallow), it took me a long time to find where the “reset advertising ID” option went so I thought I would share. On ATT galaxy s5 with marshmallow I found the reset ad id option under phone settings -> user and back up -> Google. All of the options that used to be under the Google Settings button are there too. Hi, you know how I can get it with the version 6.0.1 ?? I need to restart it from time to time as it can be automated or there is already an application that does?